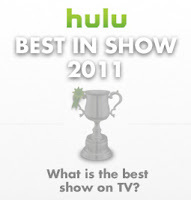 The voting for Hulu's second annual Best in Show competition is still going on, but time is running out! There are only two more days left to vote, and Supernatural. has a slight lead over Fringe in this first round of voting. Come on Fringe fans! We have almost double the viewers of Supernatural (4 million viewers vs. 2.2 million)... are their fans just more dedicated? There are also 15 other shows that need your vote, like How I Met Your Mother, Dexter, and Mad Men. The voting for round one ends on March 6th! How many times can we vote? Does anyone know? I was wondering if Alan's vote had already figured in or not as well. The race is too close to call right now. Supernatural fans are well organized and driven while I'm finding some FRINGE fans to be apathetic. We need all the fans to vote this weekend (March 5th and 6th) because a 1 percent advantage just isn't enough and you know the Supernatural fans are going to be voting in big numbers this weekend. WE NEED VOTES PEOPLE! DON'T TAKE A SELF MEDICATION BREAK WHEN WE NEED VOTES THE MOST!!! VOTE VOTE VOTE for FRINGE!! !